Alain Jardel completed his youth basketball selection process after his team's victory in Bourg-en-Bresse. In the twelve-player roster, two members: Jessie De Colo and Elsa Martins will be new to European Championship play. France finished first on point difference in the four nation tournament after beating Turkey and Russia and losing to Spain. 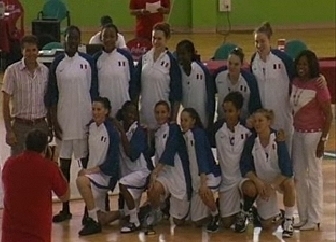 France opened the tournament with a (43-34) victory against Turkey. The match was streamed live and should be quickly forgotten by both teams. In their second game France struggled in the first half against Russia and trailed going into the interval (28-32). Then France started to play their running game after the break and went into the final quarter leading (47-41) and played well defensively to hold on to the victory (65-53). Russia beat Spain on the opening day by 26 points and beat Turkey by 30 points on the final day. However their defeat against France on the second day cost them the title. Spain came into the final match on the back of two defeats and knew that they would finish last. However when they meet France in a youth basketball match they tend to step up a gear. This match was no different: Spain were ready for France and led (16-8) by the end of the first quarter. For some reason France were unable to hit the target. Although Spain were not on fire they led by 20 points at the interval (35-15). After the break France were more aggressive and scored 7 quick points. By the time the final quarter arrived, the deficit was just 8 points (35-43). The final quarter was hectic and France took the advantage (44-43). The joy of leading did not last long as Spain went back on the attack with Leonor Rodríguez doing most of the damage with her side scoring the last 14 points of the match to secure the win (56-43). France: Plagnard (5), Tchatchouang (9), Datchy (6), Minte (2), Thizy (5). Bench scoring: Bousbaa (8), Konate (1), De Colo (4), Okou-Zouzouo (4), Medenou (1), Westelynck, Martins. Spain: Leonor Rodríguez (15), Cristina Ouviña (9), Amaia Gastaminza (7), Vega Gimeno (11), Laura Gil (7). Bench scoring: Berta Chumillas (2), Marta Tudanca, Elena Espiau, Celia Menéndez , Mireia Vila (5), Miriam Bolivar, Miriam Foraste.